Who dares confront touchy billionaire Denis O’Brien? Denis O’Brien has now launched five legal attacks against the public interest in the last several months. He is a “wealthy serial litigator”, as The Irish Times put it. Let’s take them in chronological order and then look at the broader issues they raise about inequality and power in Ireland. First, in May, RTE was preparing a report about the state-owned bank IBRC (formerly Anglo Irish) and its sale of the company Siteserv to Denis O’Brien. O’Brien said this would infringe his privacy because it would lead to revelations about his banking affairs with IBRC. O’Brien went to the courts and obtained a legal order to prevent RTE from going ahead with the programme. It was successful, and RTE postponed airing it. Second, a few days later, in the Dail, Catherine Murphy TD claimed that IBRC had apparently made loans to Denis O’Brien on favourable terms, like charging him an interest rate of 1.25% when it could have charged 7.5%. If true, this means a significant loss for IBRC and for taxpayers. But again, O’Brien sought to repress this information and sent solicitor’s letters to several media organisations asserting that no media outlet should report on Ms. Murphy’s declarations because he had a court judgment (injunction) that said so. He was again successful in virtually shutting down all news outlets in the country for a few days, until the courts confirmed that they could indeed publish the statements. Third, O’Brien has taken legal action against the parliament itself and the State for allowing Pearse Doherty TD and Catherine Murphy TD to make claims about his affairs with IBRC. O’Brien argued that this breached his rights under the Irish Constitution and the European Convention on Human Rights. Fourth, O’Brien recently started proceedings against the Dail’s Committee on Procedures and Privileges (CPP), which has an oversight role in the parliament. This is because the CPP ruled that Catherine Murphy did not abuse Dail privilege when she made claims about him. Dail privilege allows TDs to discuss sensitive matters without fear of being sued for libel. But O’Brien is now going after the CPP and each one of its 10 individual members. And yesterday, O’Brien’s lawyers sent a threatening letter to the satirical news website Waterford Whispers News demanding that it take down an article about him, which it did. The piece followed others about O’Brien, such as one entitled “Denis O’Brien To Sue Everyone”. Perhaps the central issue at the heart of these legal cases is one of private vs. public interest. In other words, the media and elected representatives have attempted to investigate and report on Denis O’Brien’s financial dealings with IBRC, and he retorted that his affairs are private and should not be exposed to public scrutiny. However, by definition, private interests cease to be private when they have consequences for the public interest. Because Denis O’Brien has accumulated so much financial and political power, a lot of what he does affects the public. This is even more true in the cases above, which concern explicitly his dealings with a bank, IBRC, owned by all of us. There is a strong argument that the public is thus entitled to know about Denis O’Brien’s affairs in such cases. The underlying problem is one of concentration of power and inequality in Ireland. 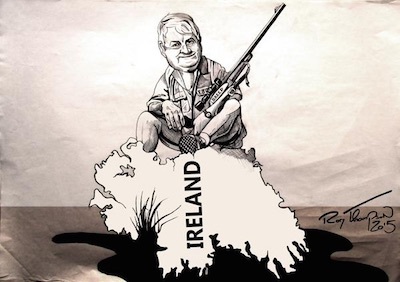 If Denis O’Brien was not as powerful as he is, his legal actions would not have gone very far. Moreover, he most likely would not even have seen the point of suing the media, Parliament, the State, and TDs in the first place. And it is here that an important irony emerges. The media and the parliament have both displayed some outrage at O’Brien’s legal actions. However, the two institutions both share a large part of responsibility for creating the conditions that gave rise to such actions, by actively supporting and creating inequality in our country, and for protecting the wealthy and powerful. * implementing austerity, which has led to high unemployment and included 84% of Irish firms cutting (24%) or freezing (60%) employees’ wages between 2008 and 2013, according to a new Central Bank study. In sum, it shouldn’t come as a surprise that Denis O’Brien feels, and is, powerful enough to decide to repeatedly sue organisations and individuals that inquire, or even joke, about his actions.